The house is in sheet rock never-never land. For a week now, three hardworking guys have shown up (at 7:00 a.m. no less), strapped on stilts and lumbered around dinosaur-like, slathering and smoothing joint compound. It is fine, fine work they are doing and it is going on forever — says the person housed in two back rooms with six dogs. But wait a minute, we don’t just live in a house, we live on a farm and thank heavens for that because there is nothing like a healthy dose of dirty work to stop your whining about nothing going on. The first thing to understand about life on a farm is how rarely anything ever goes exactly according to schedule. Like, never. 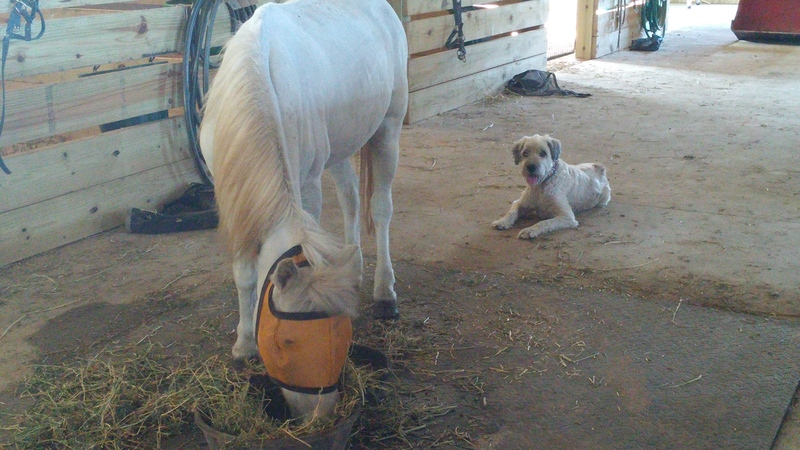 There is a certain routine to barn chores, but only approximate. 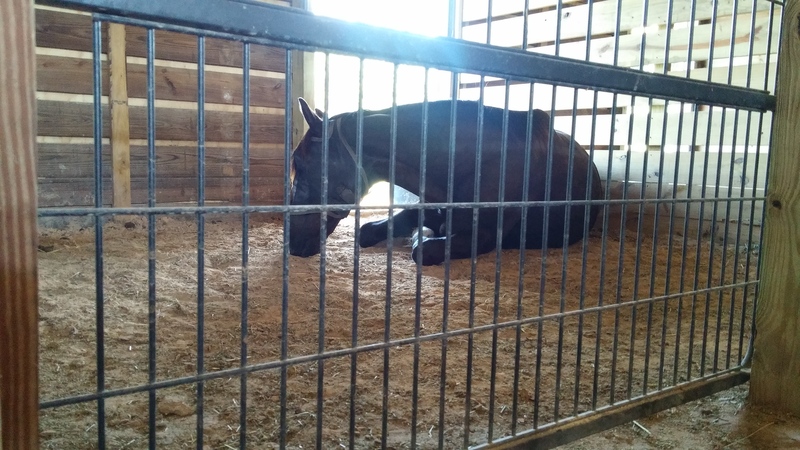 Some mornings I can coax Andante, Filou, Boo, and Belle into their stalls, call the geldings and the donkeys in from the big pasture, and get mucking done while they all quietly munch on breakfast. Some mornings, the donkeys try to help me with the mucking. 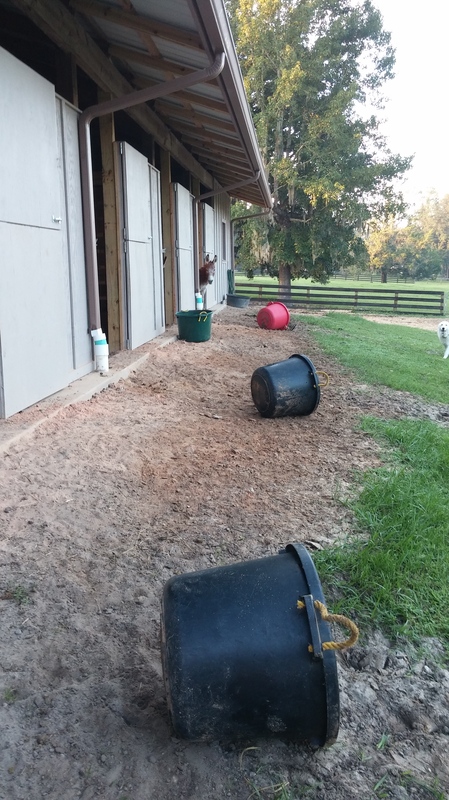 They are very endearing and earnest about it, waiting for me to empty muck buckets so they can overturn and roll or toss the buckets down the hill — their absolute favorite part. Do you see Elliott peeking at me from around the stall door? I stepped back to take this picture before emptying the last bucket. That look says, come on, Mom, you missed one and it’s my turn to do the roll! Sorry about that, Elliott. 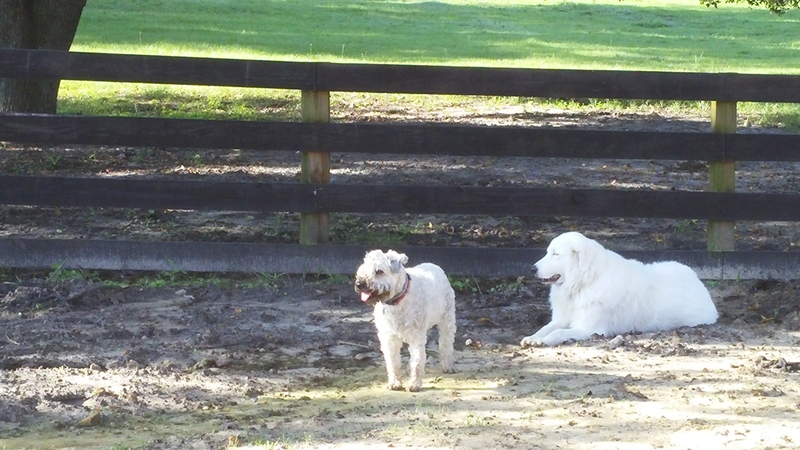 The dogs always join me for barn activities, although they have individual preferences as to how to spend that time. Monroe and Giada fly out into the big pasture as soon as the gate is opened, running across the field to check if the dog is out next door. He’s a Bernese Mountain Dog and little Miss Monroe loves to run up and down the short span of their shared fence line, daring him to out maneuver her. She always wins. Giada is not as thrilled with these exchanges and barks anxiously at Monroe, trying to coax her off on private adventures, just the two of them. 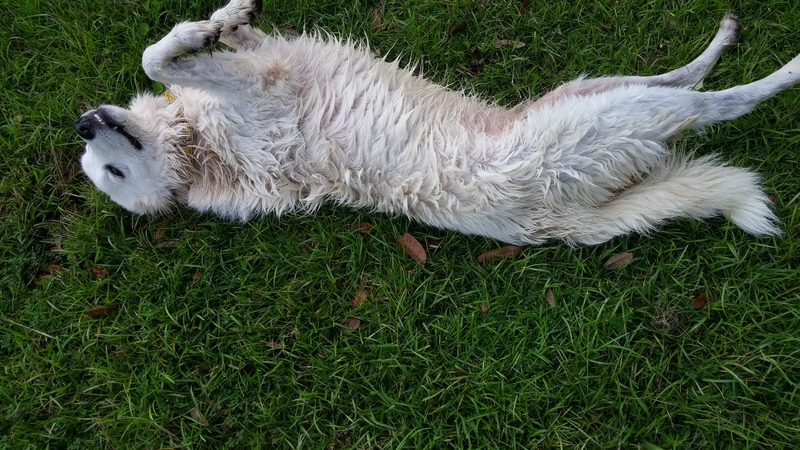 That usually involves a swim in the pond and full body grass rolls. Monroe and Giada are inseparable which means if one is missing, both are. I know when Monroe is “in trouble” because Giada has a certain bark reserved just for that, when Monroe chases with the neighbor’s dog, for example. 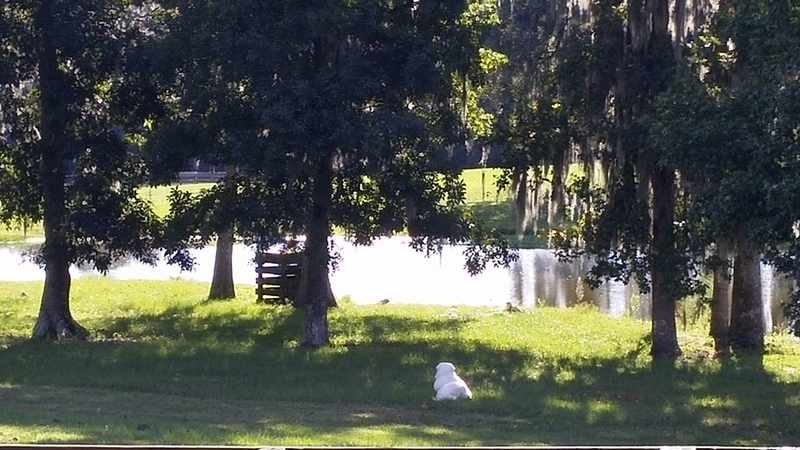 Monroe has developed a similar bark reserved for when Giada swims across the pond instead of sticking to the perimeter. She hates that because she will not go there herself and doesn’t want her friend so far away. Poor baby. 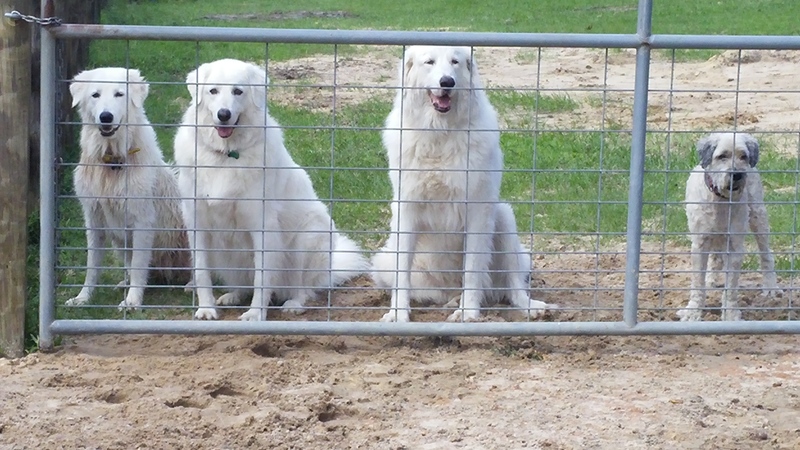 We walk the property altogether, the dogs and I, at least once a day and Monroe and Giada like to show us around. Clearly, they have this place scoped out. We recently put in a cement water trough for the horses and sunk it lower than usual so the donkeys and mini horses can reach it as well. I took this picture shortly after it went it. Monroe owns the place. Water for horses, donkeys AND Monroe. Gracie is getting old, 13, but her sense of purpose remains clear: If it’s a rodent, it must be eradicated. Unlike me, Gracie is not easily distracted from her daily routine — or trap line, as we like to call it. She is a hunter, a Master, and since day one, Sophie has been in awe of that skill. When Gracie is on full patrol, Sophie is usually right behind her. That doesn’t mean that she’s learning much, as you can see. The mouse is over here, Sophie, over here. Um, yeah. It is so hard to get a picture of Gracie because she is either in hiding or in motion. I finally caught one of her the other day. I think she was between rounds. Marco, too, is always on duty when we are outside. 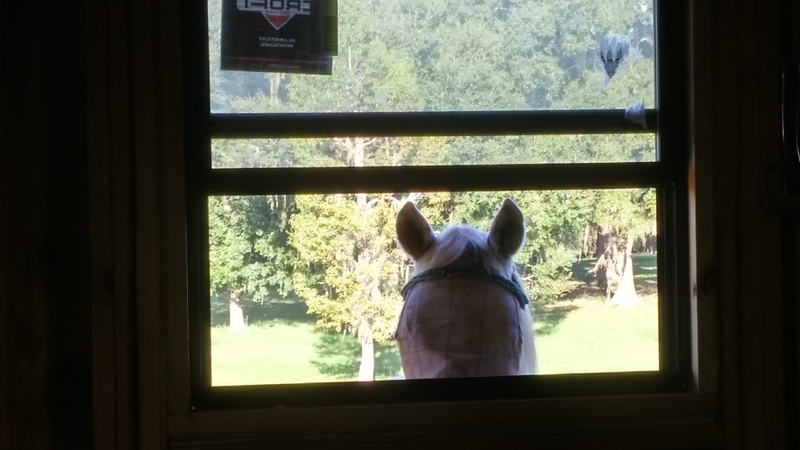 Usually, he hangs at the barn, but sometimes he hears things from further away and will take up a post between us and the thing that bothered him until he is convinced there is no danger. On this day, it took him a long time to be okay. I cannot tell you how that pulls at my heart, how safe he makes me feel. I trust that dog with my life. 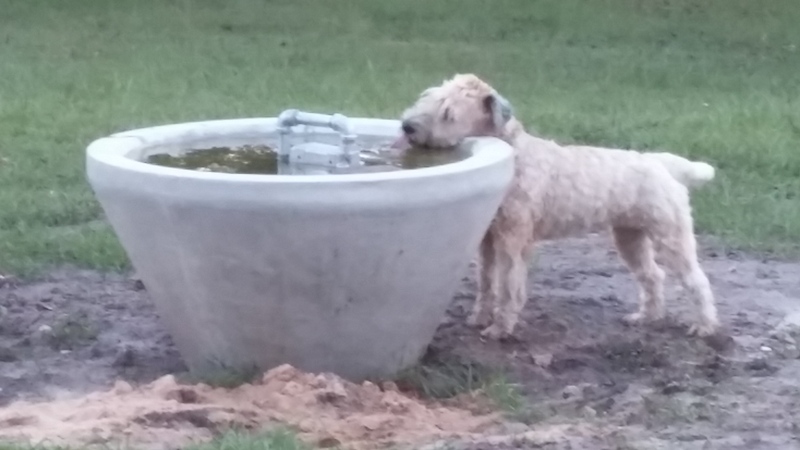 Molly is a wheaten like Monroe and Grace, but if you ask me, she is taking after the maremmas more than anything. She has no fear of the horses or donkeys and will often pull guardian duty. Here she is with Boo. Marco had been laying with Boo while he was eating his breakfast and when I passed by again, Molly had taken Marco’s place. The look on her face tells me she thinks she knows what she is doing. I think you do, too, Miss Molly. When the three boys, Legs, Beamer and Loosa, come in from the big pasture, it always makes my heart twinge a little. 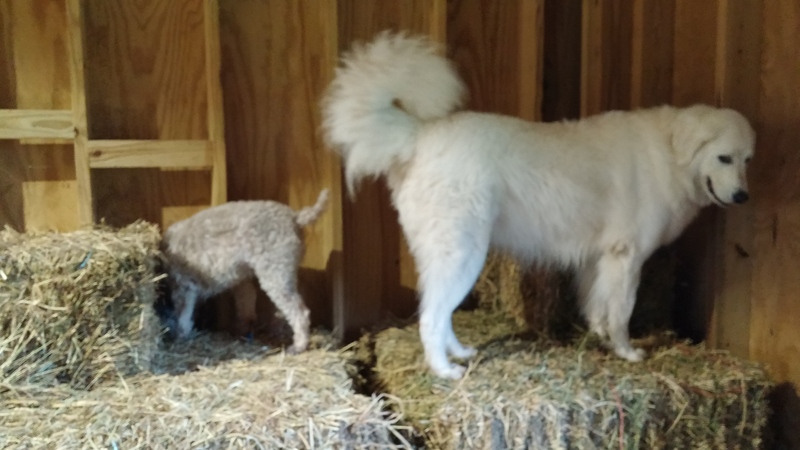 I have had to separate the herd for Filou’s sake and, while everyone has adjusted well enough to the new routine, the boys seem to miss togetherness a bit more than I can bear at times. 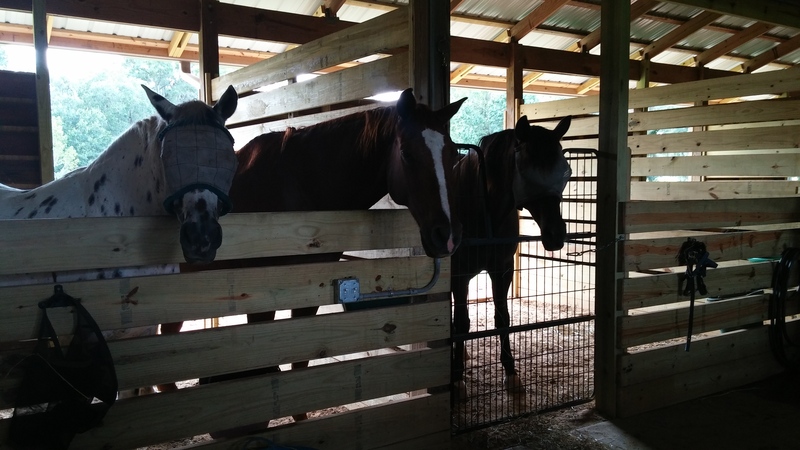 For meals, I lock the barnyard crew — Andante, Filou, Boo, and Belle — into stalls and then open up the back stall doors and the pasture gate, so the boys can wander in. They are always doing something to get my attention and I am so grateful for that. So, yes, I will reach out the window and scratch an ear. And, yes, I will let them eat together in one stall. And, yes, if it felt so good to be here that you laid down to take a nap, I will not wake you. Do not think for a moment that I am the only one working around here. When Gordy is not traveling, you will find him hoisting a muck rake or mowing, mowing, mowing. This is a luxury we are not used to, and no matter how much work it is, we will not complain. We have green grass and so much of it that the horses cannot eat it all down. 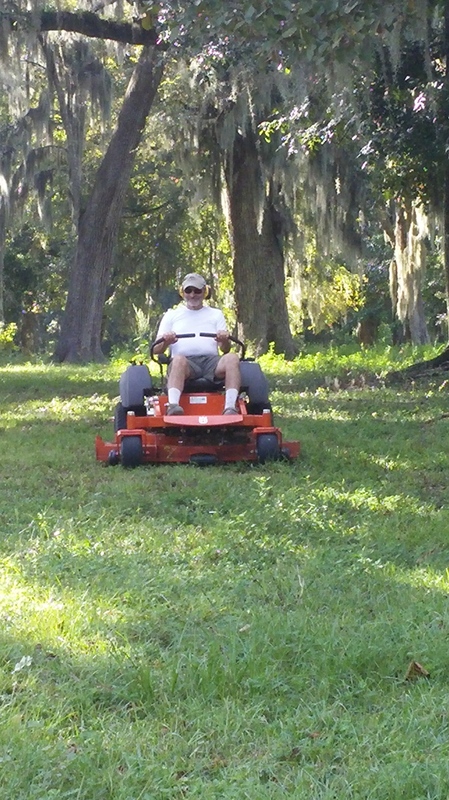 So we are always mowing something. The farm, our farm, IS a lot of work; it is also a great source of joy and personal satisfaction. It’s not just the big picture of it, but the little scenes that make my heart sing. A hundred times a day these things catch me – – first my eye, then my heart. I am swept up in the beauty of it, the intimate moments that arise because we are woven together, both two-legged and four-legged, in a web of caretaking and daily living. Someone is always eager to share those moments with me. This is what “be with” looks like. 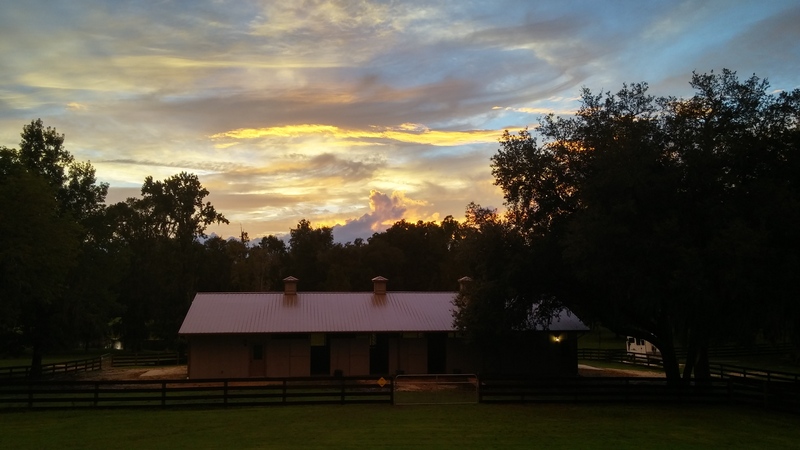 And, at the end of the day, when we go up to tuck ourselves into our two little rooms, we stop to watch the sun set over that beautiful barn and know what a good, good day it was.